The authors of 52 – Lindsay Clandfield and Luke Meddings – kindly made available six of their awesome actives to be displayed on our website. We are going to publish one of them each month, starting today. Enjoy! And if you like these samples, head over to The Round and buy the full book. By doing so you get all 52 activities and support a group of creative ELT writers so they can keep producing great stuff for teachers to use all over the world. The following are characteristics of the ‘subversive’ teacher, according to the authors Neil Postman and Charles Weingartner in their book, Teaching as a Subversive Activity (1971). The convention at this time was to refer to an unnamed person as ‘he’; today we would write ‘he or she’, or ‘they’. 1. The teacher rarely tells students what he thinks. 2. Generally, he does not accept a single statement as an answer to a question. 3. He encourages student–student interaction as opposed to student–teacher interaction, and generally avoids acting as a mediator, or judging the quality of ideas expressed. 4. He rarely summarizes the positions taken by students on the learnings that occur. He recognizes that the act of summary or “closure” tends to have the effect of ending further thought. 5. Generally, each of his lessons poses a problem for students. 6. His lessons develop from the responses of students and not from a previously determined “logical” structure. What do you think? Do you think this how a teacher should be? How many of these things do you feel are characteristic of your lessons? What do your learners think? 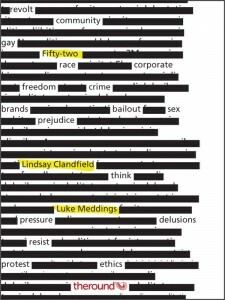 This activity comes from 52: A year of subversive activity for the language teacher, written by Lindsay Clandfield and Luke Meddings. The whole book is available for €5.00 at the round (http://the-round.com/resource/52/). This activity is reproduced here with permission from the authors. Look through a newspaper or magazine and cut out any ads that feature a man and a woman. They might be the kind of scenes where a couple sit at a cafe table, or people are in a bar. Ask learners to describe the image. – In the imagined scene, does the ad still work? Why or why not? – Do you think we need more images of these alternative couples in advertising? Essential information for any learners travelling to the US would be what their rights are if they are stopped by the police. Make a copy of the following text. Use each of these ‘rights’ to roleplay a situation. One learner plays the police officer, stopping learner B, who is walking past a demonstration. Learner B has to communicate their ‘right’. Depending on where you are teaching, it may be worth asking learners if they know their rights regarding being stopped by the police in their country. The rights shown above come from The American Civil Liberties Union (http://www.aclu.org/). If you want to use a UK instead of a US example, see the Association of Police Authorities’ ‘Know your Rights’ campaign (http://www.apa.police.uk). Imagine a very good school in a small town. The school can accommodate 300 students, but it has recently become very popular. There are now 2,000 people who wish to become students at this school. There is no way to make the school site any bigger. How can the school decide which students to accept? Let learners brainstorm ideas, and write some of these on the board. If there are any suggestions about making the school bigger, remind them that is not possible. The school begins charging 500 dollars per student per year. The number of people wishing to come in drops to 1,500. Next, the school charges 1,000 dollars. The number of people drops to 700. At 2,000 dollars per student per year, there are only 315 people left who are still signing up to come to the school because the others cannot afford it. – Can you think of situations where this sort of thing happens in real life? – Do you think this is a fair solution? Divide the class into two groups; give one group the cards from list 1, and the other group the cards from list 2. Ask each group to put the cards in order. Tell them they can leave out or repeat some stages if they like. When they have finished, tell them to display their cards, in order. Each group looks at the other group’s life. As a whole class, talk about what factors might have influenced the way these lives turned out. Now mix the cards and give each group half. Tell them to make a life story for someone based on these cards. – How do we get into trouble in life? – How can we get out of it? No matter where it may be, from the streets of Chicago to those of Cairo, when people are out demonstrating you will see signs in English. Used to attract the attention of the international media, English has become the international language of protest. Here are some popular protest sentence stems and chunks, with examples. [name of person] time to go! / [name of person] out now! [-ing form + to-infinitive] is like putting out fire with gasoline. They’re selling [whatever you’re against]. We’re not buying. (e.g. Conversation, not confrontation. / Brains not bombs). See what your learners can come up with themselves!